When teeth are lost or extracted, it can take a toll on your self-confidence as well as your overall oral health. Missing teeth can create a variety of unexpected problems, which often range from difficulty speaking and eating to the deterioration of the jawbone. Dr. Dennis E. Stansbury cares for the wellbeing of those in and around the Tyler, Texas area, and he uses customized dentures or partials to replenish his patients’ bites. 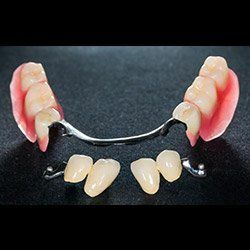 Over time, there have been plenty of advances in dental technology, which means that your denture can be specially made to fit your specific mouth. Sliding and slurring while speaking are things of the past! Say goodbye to the embarrassment created from ill-fitting dental prosthetics and see Dr. Stansbury for custom-made dentures or partials in his Tyler practice. 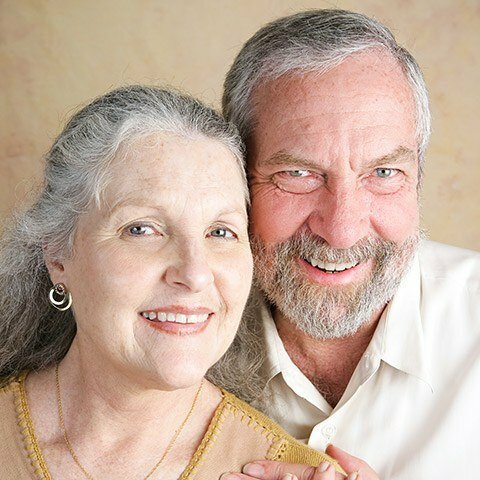 Why Choose Stansbury Dental for Full and Partial Dentures? A partial denture consists of multiple teeth on a gum-colored base. The teeth are not in a row, but rather spread across the base to fit like a puzzle with your existing teeth. This type of prosthetic is normally secured with clips or brackets, but unlike a bridge, it is removable. A full denture is a complete top or bottom row of teeth mounted onto a gum-colored base. This kind of restoration can be closed or open palate, and they stay in place through natural suction (and sometimes a little denture adhesive). 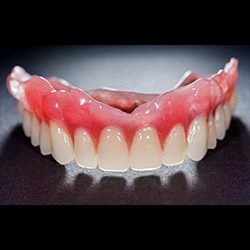 If you prefer a secure full or partial denture and do not want to deal with clips or adhesives, then consider implant-supported dentures. 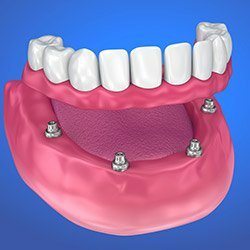 During a brief surgery, an implant dentist can secure a few dental implant posts to hold your denture firmly in place. With an implant-supported denture, you won't have to worry about slipping, and your prosthetic will feel safe and sound. Contact us today to schedule a denture consultation. Dr. Stansbury sees patients from Tyler, Flint, Lindale, Kilgore, and nearby east Texas communities. If this is going to be your first time at our office, please take a brief moment to review the helpful information on our new patient page, which we have provided for those unfamiliar with our practice. If you would like to learn about the other ways Dr. Stansbury can help your smile, take a look at our full list of services.